Küberjulgeoleku eksperdid on paljastanud, et 25 riigis maailmas kasutatakse kodanike järele spioneerimiseks jälgimisprogrammi FinSpy. Sealhulgas on programm kasutusel ka Eestis ja Lätis, vahendas New York Timesi Delfi. Programmi tõid päevavalgele Toronto Ülikooli Munk julgeoleku ekspert Morgan Marquis-Boire ja California Ülikooli arvutiteadlane Bill Marczak. Nad said enda kätte hulgaliselt kahtlase sisuga e-kirju, milles sisaldus salajast informatsiooni jälgimisprogrammi FinSpy kohta. Väidetavalt on võimalik nuhkvaraga siseneda inimese arvutisse ja näiteks salvestada tema Skype`i vestlusi, lülitada sisse veebikaamera ja mikrofon ning jälgida, millega inimene hetkel tegeleb. Ka FinFisheri nimel all tuntud programm avastati eelmisel aastal, kuid nüüd on eksperdid veendunud, et jälgimisprogrammi tõepoolest kasutatakse vähemalt 25 riigis. FinSpy suhtleb ka Eestis ja Läti asuvate serveritega, kuid veel pole selge, kas siin asuvad mõned tarkvara juhtserverid või kasutavad jälgimistarkvara konkreetsed asutused. News Wave kirjutab, et Briti kompanii Gamma Group müüb FinSpy nuhkvara valitsustele ning artikkel annab mõista, et Eesti ja Läti valitsused on varustatud jälgimisprogrammiga, mis aitab kodanike internetitegevusel silma peal hoida. 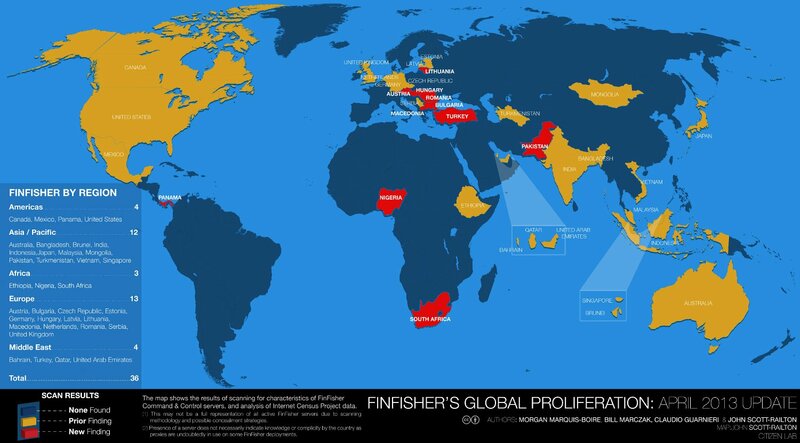 Read more: http://www.businessinsider.com/countries-with-finfisher-spying-software-2013-5#ixzz2W7T8o6d0A new report presents overwhelming evidence that sophisticated spying software is being abused by governments around the world. The findings by The Citizen Lab, a digital research laboratory at the University of Toronto, detail how the software marketed to track criminals is being used against dissidents and human rights activists. Titled "For Their Eyes Only: The Commercialization of Digital Spying," the report focuses on a type of surveillance software called FinSpy that can remotely monitor webmail and social networks in real time as well as collect encrypted data and communications of unsuspecting targets. In December 2011 WikiLeaks began publishing FinFisher brochures and videos, which tout the software as enabling governments to monitor targets who "regularly change location, use encrypted and anonymous communication channels, and reside in foreign countries." Another remarkable thing about the FinSpy, Jean Marc Manach of OWNI notes, is that it can take control of any major operating system while none of the top 40 antivirus systems can recognize it. The report caused Mozilla, the maker of the Firefox browser, to send a cease-and-desist letter to UK-based Gamma International, FinFisher's parent company, because it says FinSpy "is designed to trick people into thinking it's Mozilla Firefox." During the downfall of Egyptian ruler Hosni Mubarak, dissidents ransacking the offices of Egypt's secret police discovered a contract from Gamma detailing a $380,000 license to run the software for five months. The Citizen Lab report lays out how the surveillance tech has also been widely used to monitor activists and dissidents in Bahrain. 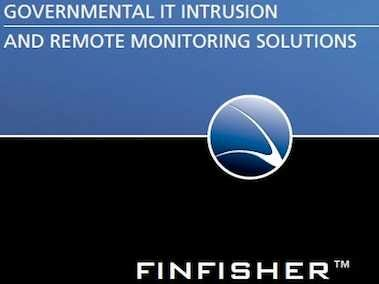 FinFisher also offers a mobile version of its spying system so that authorities can spy on data and communications from mobile phones, even when encrypted. The report comes two weeks after Google CEO Eric Schmidt wrote in the Wall Street Journal that "the dark side to the digital revolution that is too often ignored" involves technology that "can provide powerful new tools for dictators to suppress dissent." Schmidt noted that "everything a regime would need to build an incredibly intimidating digital police state — including software that facilitates data mining and real-time monitoring of citizens — is commercially available right now." The Citizen Lab report reveals that governments are increasingly taking advantage of that reality. The researchers conclude that the proliferation of this type of increasingly powerful surveillance equipment "has serious implications not just for dissidents and activists, but for all of us, no matter our citizenship" given the idea that people have a right to secure communications.